Sometimes, opportunities fall into our laps when we're least expecting them. A team of CERN surveyors, in collaboration with the Institute of Plasma Physics in Prague (IPP), has developed a pioneering laser beam while working on a particularly challenging alignment system. "While developing the alignment system for the HIE-ISOLDE accelerator, we discovered that the system generating a structured laser beam had astonishing optical properties", explain Jean-Christophe Gayde (CERN, EN-SMM-ESA) and Miroslav Šulc (IPP), the system's inventors. "We didn't initially plan to develop a generator for this kind of laser beam, but the results of our research were very encouraging." Continuing with the "unplanned" project, the two teams developed the "structured laser beam", which is extremely innovative in that it produces beams that are almost non-diffractive. The central axis of the beams diverges very little, even over a distance of several hundred metres: 200 metres from the system, the central axis of the laser measures only a few millimetres in diameter, hardly more than when it left the generator (see image 2). The systems available on the market produce such beams over a distance of only a few metres. Its exceptional properties give the structured laser beam potential in many fields, including communication, medicine, physics and, above all, metrology. "At CERN, this laser would be a valuable tool for aligning magnets, thanks to its low central divergence", says Jean-Christophe Gayde. "And it has one particularly remarkable characteristic: in certain conditions, the beam reconstructs itself after meeting an obstacle. In other words, its halo can reconstruct the central beam after it has passed the obstacle, in a similar way to a Bessel beam." 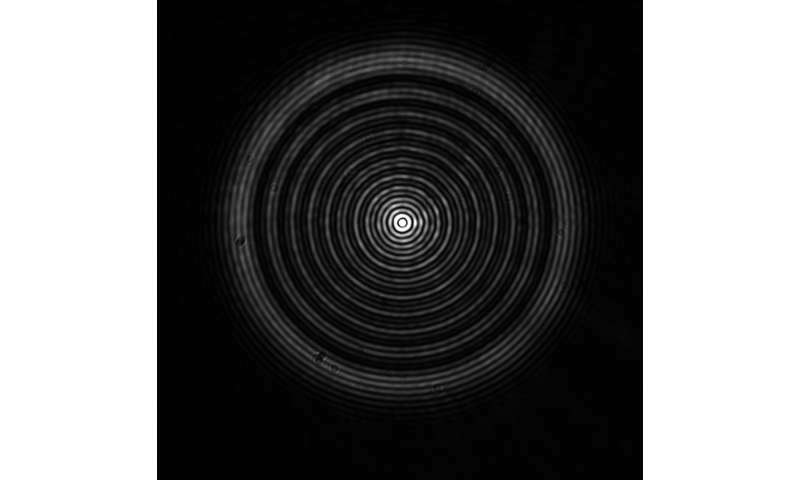 The structured laser beam can be produced from source laser beams in a wide range of wavelengths and its geometry can be easily adapted (diameter of the central divergence, number of circles in the halo, etc.). The generator itself can be very compact (the size of a matchbox) and adjustable, while still being fairly inexpensive. "We filed a patent application in May 2018 and since then we've been in talks with several potential clients in Europe to establish collaborations", says Amy Bilton, the knowledge transfer officer (KTO) responsible for the project within CERN's Knowledge Transfer group. "Studies are ongoing and more tests are needed, but the structured laser beam could considerably improve some applications that use light beams, in particular laser beams."